TRIPOLI - Libya's transitional leader has declared liberation of the country, three days after the death of its leader of four decades, Muammar Qaddafi. Mustafa Abdul-Jalil also told thousands of supporters at a ceremony on Sunday that Islamic Sharia law would be the "basic source" of legislation in the country, and that existing laws that contradict the teachings of Islam would be nullified. In an address that set an Islamist tone for post-Qaddafi Libya, he said new banks would be set up to follow the Islamic banking system, which bans charging interest. "This revolution was looked after by God to achieve victory," he told the crowd. The declaration, officials say, will start the clock for elections after months of bloodshed that culminated in Qaddafi's death last week. Video: What next for Libya? Jalil, chairman of the National Transitional Council (NTC), presided over Sunday's ceremony in Benghazi, the revolution's birthplace, alongside the leaders of the military units that fought Qaddafi's forces since last February. As delegates addressed the densely-packed crowd, soldiers held a huge Libyan flag inscribed with an Arabic message from the top of a nearby building. Jalil himself greeted people in the crowd and, at one point, held a handgun aloft. Sunday's celebration comes more than two months after revolutionary forces swept into Tripoli and seized control of most of the oil-rich North African nation. 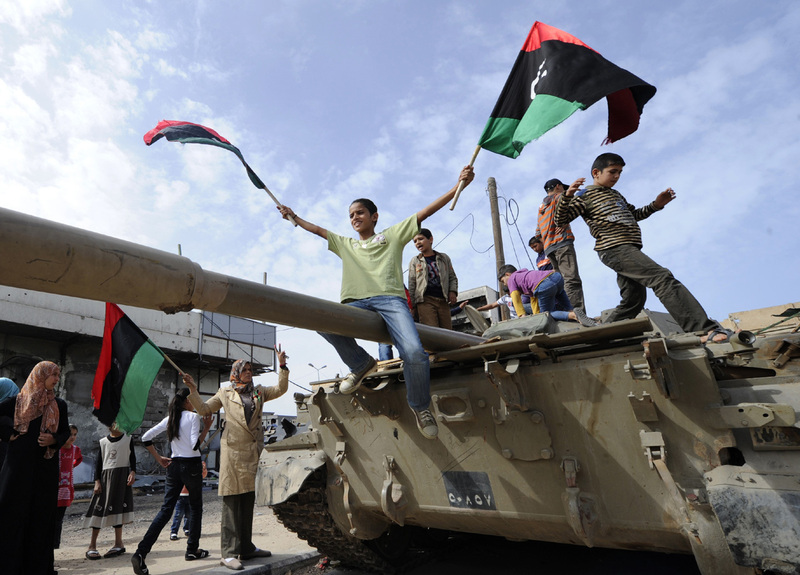 It was stalled by fierce resistance by Qaddafi loyalists in his hometown of Sirte, Bani Walid and pockets in the south. Sirte was the last to fall, but Qaddafi's son and one-time heir apparent and many of his fighters have apparently escaped, raising fears they could continue to stir up trouble. The victory has been clouded by questions over how Qaddafi was killed after images emerged showing he was found alive and taunted and beaten by his captors.